Sacha Cosmetics Lipsticks |Are All The Purple Shades The Same? With the launch of new colours to Sacha’s Intense Lipstick Collections and Matte collections many have been wondering if they are all the same shades of colours. The new Shade ‘Dem Trini Girls’ have been compared to similar colours from previous lipstick collections. 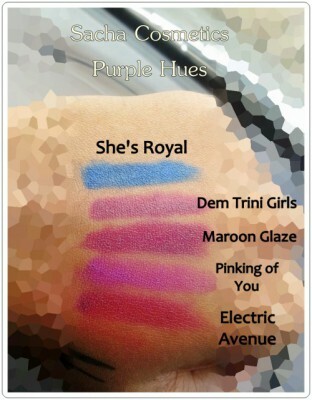 Below are swatches some of Sacha’s top selling Purple Lipsticks to show the difference in texture and colour. The following colours after ‘She’s Royal’ are four different shades from Both Sacha’s Intense Collection and Matte Collection. The second colour is ‘Dem Trini Girls’, Sacha’s Newest Matte Purple, third is Maroon Glaze from their Cream Lipsticks Collection. Maroon Glaze is creamier and glossy than ‘Dem Trini Girls’ the texture is different between these two lipsticks, however the colours are very close. The fourth colour is ‘Pinking of You’, which is more of a pinkish colour and very matte. And the last colour, ‘Electric Avenue’ from Sacha’s Matte Collection, has red undertones mixed with purple creating a very deep dark purple.